Peck Morrison, bass; Dave Bailey, drums; Ray Barretto, congas. 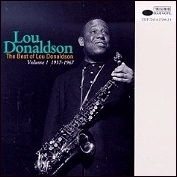 This is the third liner I have written concerning the music of Lou Donaldson. Add to this the times I have listened to him on other recordings and in person, and I believe I'm qualified as at least a minor expert on L.D. Certainly, I am conversant with his manner of playing. Lou, like any other jazz musician, has some characteristic turns of phrase. He also likes to insert quotes from other songs. Although he is descendant, in the main, from Charlie Parker, Donaldson has his own things to say in this style. 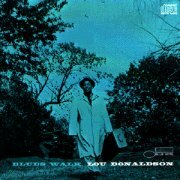 The title tune, "Blues Walk," a Donaldson minor blues line, starts everything rocking. Peck Morrison on bass, Dave Bailey on drums, and Ray Barretto on congas really lay that beat down with Ray strong on two and four. While this is going on, Donaldson is soaring, singing and wailing. Herman Foster follows on piano with typical single line and tremolant chordal attacks. After Bailey and Barretto exchange ideas, Lou returns. Denzil Best's "Move" [mp3] is taken at its word as Lou flies first; then effectively strolls after Herman's mixture. Donaldson swings "The Masquerade Is Over" away from its usual ballad tempo in a lilting manner. As in "Move," he comes back for a stroll after Foster's portion. The tune really lends itself to a superior performance by Lou. Side two opens on "Play Ray," a Donaldson blues whose melody is stated by Barretto playing a three-note melodic figure on his conga and Lou answering him. Foster solos first followed by Lou. A walking two choruses by Morrison precedes breaks by the two drummers. "Autumn Nocturne" is a tender, sweet but never sticky ballad rendition by Donaldson. If some of the so-called "jazz" vocalists who have cropped up in increasing numbers in years, could learn anything from Lou here, they might improve themselves. Foster has a Garnerized bit separating Lou's two statements. Donaldson's cooking riffer, "Callin' All Cats" is a fine finisher to a well-paced set. Lou and Herman have the first solos; then the leader strolls. Peck and Ray exchange four-bar thoughts for a chorus followed by Lou and Dave in the same format for another one. Bailey also handles the bridge in the final melody statement as all cats are counted and accounted for.